Sickle cell disease is one of the most common genetic diseases worldwide with the highest prevalence in sub-Saharan Africa, especially Nigeria [1Serjeant, GR. Sickle-cell disease.Lancet. 1997;350(9079):725–730. [CrossRef], [PubMed], [Web of Science ®], [Google Scholar],2Modell B. Guidelines for the control of haemoglobin disorders. WHO; 1994. WHO/HDP/HB/gl/94.1 [Google Scholar]]. It is a disorder characterized by high mortality and morbidity. Early detection and diagnosis of sickle cell disease followed by counseling, supportive and preventive treatment of affected persons, is crucial to reducing mortality and minimizing complications [3Adewoyin AS. Management of sickle cell disease: a review for physician education in Nigeria (sub-Saharan Africa). Anemia. 2015;2015:791498. doi: 10.1155/2015/791498. [CrossRef], [PubMed], [Web of Science ®], [Google Scholar],4Nnodu OE. Interventions for the prevention and control of sickle cell disease at primary health care centres in Gwagwalada Area Council of the Federal Capital Territory, Nigeria. Cureus. 2014;6(8):e194. doi: 10.7759/cureus.194[CrossRef], [Google Scholar]]. Improved outcomes have been reported for patients following early diagnosis, as newborns and young children, even in resource-limited settings [5Rahimy MC, Gangbo A, Ahouignan G, et al. Effect of a comprehensive clinical care program on disease course in severely ill children with sickle cell anemia in a sub-Saharan African setting. Blood. 2003;102(3):834–838. [CrossRef], [PubMed], [Web of Science ®], [Google Scholar]]. According to the National Demographic Survey of 1999 in Nigeria [6National Population Commission (NPC) [Nigeria] and ICF Macro: Nigeria Demographic and Health Survey, 2008. The Demographic and Health Surveys (DHS) Program, 2009. (http://dhsprogram.com/publications/publication-search.cfm.) ], the prevalence of sickle cell disease is 2.0% at birth and 0.05% in adults. Thus Nigeria, with a current population of ∼170 million [7Piel FB, Patil AP, Howes RE, et al. Global epidemiology of sickle haemoglobin in neonates: a contemporary geostatistical model-based map and population estimates. Lancet. 2013;381(9861):142–151. [CrossRef], [PubMed], [Web of Science ®], [Google Scholar]], has the largest burden of sickle cell disease in the world. The difference in sickle cell disease prevalence of 2.0% at birth and 0.05% in adults is attributable to deaths in early childhood, making it a major contributor (8.0%) to the national under-fives’ mortality figures [4Nnodu OE. Interventions for the prevention and control of sickle cell disease at primary health care centres in Gwagwalada Area Council of the Federal Capital Territory, Nigeria. Cureus. 2014;6(8):e194. doi: 10.7759/cureus.194[CrossRef], [Google Scholar]]. Although some investments have been made in the purchase of equipment for newborn screening and a screening protocol has been developed by the Nigerian Federal Ministry of Health, there is still no national screening program for sickle cell disease [4Nnodu OE. Interventions for the prevention and control of sickle cell disease at primary health care centres in Gwagwalada Area Council of the Federal Capital Territory, Nigeria. Cureus. 2014;6(8):e194. doi: 10.7759/cureus.194[CrossRef], [Google Scholar],8Akodu SO, Diaku-Akinwumi IN, Njokanma OF. Age at diagnosis of sickle cell anaemia in Lagos, Nigeria. Mediterr J Haematol Infect Dis. 2013;5(1):2013001. doi: 10.4084/MJHID.2013.001. [CrossRef], [Google Scholar]]. Factors impeding the setting up of screening programs include the lack of trained personnel, high cost of equipment and reagents for laboratory detection of common hemoglobin (Hb) variants making screening programs in sub-Saharan Africa minimal, expensive and mostly regional in outlook [9Tshilolo L, Kafando E, Sawadogo M, et al. Neonatal screening and clinical care programmes for sickle cell disorders in sub-Saharan Africa: lessons from pilot studies. Public Health. 2008;122(9):933–941. [CrossRef], [PubMed], [Web of Science ®], [Google Scholar],10Alsan MM, Westerhaus M, Herce M, et al. Poverty, global health, and infectious disease: lessons from Haiti and Rwanda. Infect Dis Clin North Am. 2011;25(3):611–622. [CrossRef], [PubMed], [Web of Science ®], [Google Scholar]], thereby resulting in delayed diagnosis. Various assays are in use for the diagnosis of sickle cell disease such as Hb electrophoresis, also known as cellulose acetate electrophoresis (CAE), isoelectric focusing (IEF) and high performance liquid chromatography (HPLC), but these require highly-trained technicians, who are largely unavailable in resource-limited settings where, unfortunately, sickle cell disease is most prevalent [11Piel FB, Hay SI, Gupta S, Weatherall DJ, et al. Global burden of sickle cell anaemia in children under five, 2010-2050: modelling based on demographics, excess mortality, and interventions. PLoS Med. 2013;10(7):e1001484. doi: 10.1371/journal.pmed.1001484. [CrossRef], [PubMed], [Web of Science ®], [Google Scholar],12Williams TN. An accurate and affordable test for the rapid diagnosis of sickle cell disease could revolutionize the outlook for affected children born in resource-limited settings. BMC Med. 2015;13:238. doi: 10.1186/s12916-015-0483-4. [CrossRef], [PubMed], [Web of Science ®], [Google Scholar]]. The crucial need for the development of a low-cost diagnostic test for sickle cell disease has been advocated as a priority by WHO [13Diallo D, Tchernia G. Sickle cell disease in Africa. Curr Opin Hematol. 2002;9(2):111–116. [CrossRef], [PubMed], [Web of Science ®], [Google Scholar]]. Point-of-care diagnosis of sickle cell disease, using a low-cost, portable device will substantially improve patient care by promoting early diagnosis [14Pagana KD, Pagana TJ, Editors. Mosby’s Manual of Diagnostic and Laboratory Tests. St. Louis, MO, USA: Mosby Elsevier, 2006. [Google Scholar]] and community-based screening. It will also go a long way in decreasing the burden on already encumbered hospitals and centralized laboratories [15National Committee on Clinical Laboratory Standards (NCCLS), User Protocol for Evaluation of Qualitative Test Performance; Approved Guideline, in NCCLS document EP12-A [ISBN 1-56238-48-6]. NCCLS, Wayne, PA, USA. (http://demo.nextlab.ir/getattachment/941b0557-33b3-4739-8fcf-45f8088ae6dc/CLSI-EP12-A.aspx; accessed April 5 2017). ]. A number of point-of-care testing (POCT) devices have recently been developed and most are based on solubility-testing methods (SICKLEDEX®; Streck, Omaha, NE, USA; SICKLE-CHECK; TCS Biosciences Ltd, Botolph Claydon, Buckinghamshire, UK). However, Hb S (HBB: c.20A>T) solubility-based methods are inappropriate diagnostic techniques due to a number of pitfalls such as the inability to differentiate between the sickle cell trait and Hb S compound heterozygous states [e.g. Hb SC (HBB: c.19G>A), Hb S-D-Ibadan [β87(F3)Thr→Lys; HBB: c.263C>A], Hb SE (HBB: c.79G>A), etc. ], and inaccuracy in the newborn due to predominance of Hb F [15National Committee on Clinical Laboratory Standards (NCCLS), User Protocol for Evaluation of Qualitative Test Performance; Approved Guideline, in NCCLS document EP12-A [ISBN 1-56238-48-6]. NCCLS, Wayne, PA, USA. (http://demo.nextlab.ir/getattachment/941b0557-33b3-4739-8fcf-45f8088ae6dc/CLSI-EP12-A.aspx; accessed April 5 2017). ,16Wethers DL. Sickle cell disease in childhood: Part II. Diagnosis and treatment of major complications and recent advances in treatment.Am Fam Physician. 2000;62(5):1309–1314. [PubMed], [Web of Science ®], [Google Scholar]]. They have also been shown to fail in the detection of Hb S in the presence of severe anemia [17Hara S. Reliability and modification of Sickledex test. J Natl Med Assoc. 1973;65(5):431 passim. [PubMed], [Google Scholar]], because they are prone to giving false positive results. In addition, the reagents have a relatively short shelf-life, thus requiring regular restocking, which may increase the financial implications in low-resource healthcare systems [18Chen TG, Lathrop RP, Shevkoplyas SS. The case for rapid diagnosis of sickle cell disease: a literature review. J Global Health Perspect. 2012:1–7 [Internet]. (http://jglobalhealth.org/article/the-case-for-rapid-diagnosis-of-sickle-cell-disease-a-literature-review-3/; accessed April 5 2017). ]. Electrophoresis is the primary laboratory test used to detect abnormal Hb variants and to diagnose sickle cell disease at most centers [14Pagana KD, Pagana TJ, Editors. Mosby’s Manual of Diagnostic and Laboratory Tests. St. Louis, MO, USA: Mosby Elsevier, 2006. [Google Scholar]]. Undocumented findings show that CAE is the most common method in Nigeria. However, quality assurance schemes are not widely established and coupled with few specialist vendors of standard laboratory reagents for CAE, some laboratories, in order to save cost, recover and re-use cellulose acetate strips for CAE assays. It is speculated that this practice may contribute to the differences observed in the results for the same sample when tested in different laboratories. Testing by HPLC or IEF is available in only a few laboratories and, at US$21.00/HPLC test, is approximately 25.0% of the monthly minimum wage in the country. A host of the aforementioned factors negatively affect the acceptability and feasibility of these test methods for sickle cell disease screening. All these make the search for a simple, rapid, inexpensive point-of-care screening method compelling. We evaluated a novel POCT (SickleSCAN™; BioMedomics Inc., Durham, NC, USA), as a screening tool for sickle cell disease in a real world primary healthcare setting by assessing its performance parameters against the HPLC method, which is the ‘gold standard,’ and compared the same to the performance of CAE. SickleSCAN™, which is based on qualitative lateral flow immunoassay principle, tests for the presence of Hbs A, S and C, and, as such, can putatively detect both the carrier state for sickle cell disease in addition to both Hb SS and Hb SC [19Kanter J, Telen MJ, Hoppe C, et al. Validation of a novel point of care testing device for sickle cell disease.BMC Med. 2015;13:225. doi: 10.1186/s12916-015-0473-6. [CrossRef], [PubMed], [Web of Science ®], [Google Scholar]]. In addition, we evaluated the acceptability and feasibility of this POCT device from both provider and patient perspectives. This study was undertaken in two phases: in the first phase, we evaluated the performance characteristics of the device. The acceptability and feasibility of it as a screening tool was assessed in the second phase. For the first phase, we developed a protocol based on the guidelines for evaluation of qualitative tests by the Clinical and Laboratory Standards Institute (CLSI) [15National Committee on Clinical Laboratory Standards (NCCLS), User Protocol for Evaluation of Qualitative Test Performance; Approved Guideline, in NCCLS document EP12-A [ISBN 1-56238-48-6]. NCCLS, Wayne, PA, USA. (http://demo.nextlab.ir/getattachment/941b0557-33b3-4739-8fcf-45f8088ae6dc/CLSI-EP12-A.aspx; accessed April 5 2017). ]. SickleSCAN™ was evaluated in the diagnosis of Hb SS, Hb SC and Hb AS against HPLC in children, aged 9 months to 5 years, and adults attending the Gwagwalada Town Clinic (GTC), Abuja, Nigeria. Our study did not include neonates or subjects in early infancy because the manufacturer specified that SickleSCAN™ had not been validated for that age category, especially in the context of high Hb F levels. This clinic is in Gwagwalada, Gwagwalada Area Council [4Nnodu OE. Interventions for the prevention and control of sickle cell disease at primary health care centres in Gwagwalada Area Council of the Federal Capital Territory, Nigeria. Cureus. 2014;6(8):e194. doi: 10.7759/cureus.194[CrossRef], [Google Scholar]], Federal Capital Territory, Abuja, Nigeria. The clinic was established by the Federal Capital Development Authority in 1981 and was handed over to Gwagwalada Area Council in 2000; it offers primary healthcare services. Consecutive consenting individuals attending the Town Clinic in Gwagwalada were tested at the point of care in the clinic, excluding subjects who had been transfused in the previous 3 months. Samples were collected directly from the patients by finger prick for testing. Informed consent was obtained from all individuals including the parents of the children. Clearance was obtained from the Ethics Review Board of the University of Abuja Teaching Hospital, Gwagwalada, Nigeria prior to commencement of the study. (Ref. UATH/HREC/469). Basic demographic data were obtained using a simple questionnaire. The SickleSCAN™ test was performed on site at the Town Clinic by the study team of hematologists, public health physician, chemical pathologist, laboratory scientist, lay persons and on-site community health extension workers. Apart from the corresponding author, none of the other team members had used the SickleSCAN™ prior to field testing. For each subject tested, a small amount of blood was taken by finger prick using a capillary sampler. The sampler was placed into the buffered pre-treatment module to release Hb by lysing erythrocytes. The same team member performed this step in all the subjects. Three drops of the treated sample were dropped from the pre-treatment module into the sample inlet of the SickleSCAN™ cartridge and allowed to migrate. The SickleSCAN™ revealed the presence of Hbs A, S and C by a dark blue line in their designated zones on the test device (Figure 1). Results were read within 5 min. by an observer and independently confirmed by two members of the team. The latter, whose readings were within a time frame of 2–3 min. of the initially observed reading, were to assess the degree of concordance between the observers. The other team members also observed the confirmed positive results with SickleSCAN™. Figure 1. Sample of a batch of the study’s SickleSCAN™ test performance with interpretation. Venous blood (2 mL) was collected from each subject into a vacutainer containing EDTA as anticoagulant for subsequent testing by CAE (Helena Biosciences Europe, Gateshead, Tyne and Wear, UK) and HPLC (VARIANT II™; Bio-Rad Laboratories, Marnes-la-Coquette, France). A 3-way comparison for sensitivity and specificity, representing SickleSCAN™ as test (new), CAE as (old) and HPLC as the reference method for ‘true’ diagnosis was conducted [15National Committee on Clinical Laboratory Standards (NCCLS), User Protocol for Evaluation of Qualitative Test Performance; Approved Guideline, in NCCLS document EP12-A [ISBN 1-56238-48-6]. NCCLS, Wayne, PA, USA. (http://demo.nextlab.ir/getattachment/941b0557-33b3-4739-8fcf-45f8088ae6dc/CLSI-EP12-A.aspx; accessed April 5 2017). ]. In addition to the study specimens, clinical controls comprising samples with known Hb phenotypes, AA, AS, SS and SC, were tested in the CAE and HPLC assays. In the second phase of the study, the acceptability and feasibility of using SickleSCAN™ for screening for sickle cell disease was undertaken between subjects and healthcare workers, the latter comprising doctors, laboratory scientists, nurses and community health extension workers. This involved 10 tertiary-level health institutions spread across the six geopolitical zones of the country. None of the participants in the first phase was involved in the second phase. These healthcare workers termed evaluators in the context of the study, in each center, observed a prior single demonstration of the SickleSCAN™ test process undertaken by a lead person who had custody of the procedure manual (insert) in the test kit box, before commencement of the test processes. The survey tools were distinct questionnaires for the subjects and evaluators, respectively. The survey of all healthcare workers who participated in the screening tests was done using a semi-structured questionnaire to assess the level of acceptability and feasibility of SickleSCAN™ as a screening tool. Parameters assessed included overall experience in use of SickleSCAN™, turnaround time, acceptability of estimated cost and willingness to recommend SickleSCAN™ for use as a POCT. These parameters except willingness to recommend SickleSCAN™, were graded on a scale of 1 to 5, with the least scale (1) signifying ‘bad/very unacceptable’ while the highest scale (5) stood for ‘very good/very acceptable’ (Table 1). Table 1. Survey scale and description. For the subjects who were screened for sickle cell disease using SickleSCAN™ by the evaluators, a short-structured questionnaire was administered afterwards to assess outcomes such as overall experience with the test, turnaround time, levels of discomfort and satisfaction, and eagerness to recommend SickleSCAN™, as indices of acceptability of the POCT. Similar to the evaluators’ format, all but one of the tested parameters (recommendation of SickleSCAN™ to others), were categorized on a scale of 1 to 5 (Table 1). The performance parameters assessed in our study included diagnostic sensitivity, specificity and efficiency of SickleSCAN™ vis-a-vis HPLC. Differences between sensitivities and specificities of SickleSCAN™ and CAE were also evaluated. The acceptability and feasibility outcomes of the second phase of the study was analyzed in descriptive statistic format. The first phase was a small pilot study. Sixty subjects, comprising 34 males and 26 females, were recruited for evaluation, of whom 42 were children, while 18 were adults with mean ages of 18.7 months and 28.7 years, respectively. The subjects were spread across the various ethnic groups in Nigeria, in keeping with the diverse nature of the inhabitants of the Federal Capital Territory. One of the subjects opted out after the SickleSCAN™ test without submitting a sample for HPLC and CAE testing. Of the remaining 59 evaluations, two were deemed invalid because of defective SickleSCAN™ test results characterized by appearance of blue lines in all the three (A, S, C) bands as well as the control band following testing. These outcomes were adjudged by the research team to be most probably due to a factory defect and, as recommended by the manufacturers, they were thus considered invalid. This left a total of 57 viable SickleSCAN™ test results for analysis. High performance liquid chromatography showed two (3.5%) of the 57 subjects had sickle cell disease, one homozygous Hb SS and Hb SC, respectively, while 14 (24.6%) had Hb AS (Table 2). The subjects with Hb SS (a 3-year-old female) and Hb SC (9-month-old female), had not been previously diagnosed or had any prior clinical manifestations of sickle cell disease. The mother of the subject with Hb SC was tested and found to have an Hb AC (βS/βC) phenotype by CAE and HPLC. The SickleSCAN™ POCT device correctly identified the two cases of sickle cell disease by HPLC, but had one false positive test result (i.e. Hb AS was diagnosed as SS). It also appropriately identified 12 out of the 13 subjects with sickle cell trait, while recording one false positive and one false negative result, respectively (Table 2). It is pertinent to state that the independent interpretation of each test reading by the three observers was in agreement. Comparative analysis of SickleSCAN™ and the HPLC tests results showed sensitivities of 100.0, 92.9 and 97.6% for sickle cell disease, Hb AS and Hb AA phenotypes, respectively (Table 3). The specificities of SickleSCAN™ for sickle cell disease, Hb AS and Hb AA were 98.2, 97.7 and 100.0%, respectively (Table 3). The efficiency of the SickleSCAN™ test was 98.2% for Hb AA and sickle cell disease (SS and SC) and 96.5% for sickle cell trait (AS) and Hb AC. Table 3. Overall experience using SickleSCAN™. The results of the CAE test when compared to the HPLC results showed that CAE identified the sickle cell disease subjects without any false positive or negative results but there were three false positive results for the Hb AA phenotype when the subjects were sickle cell trait carriers (Hb AS) (Table 2). The only Hb AC result was reported as Hb AA by CAE. Analysis of the performance characteristics of CAE showed a 100.0% diagnostic sensitivity for sickle cell disease and Hb AA but a diagnostic sensitivity of 76.9% for sickle cell trait. It had 100.0, 97.7 and 81.3% diagnostic specificities for sickle cell disease, sickle cell trait and Hb AA phenotype, respectively. Statistical measure of agreement (sickle cell disease-positive) of the test method (SickleSCAN™) to HPLC (reference method) was 100.0%, while the agreement of test method to the comparative reference method (sickle cell disease- and sickle trait-negative) was 97.6%. Overall test efficiency of CAE was 100.0, 93.0 and 94.7% for sickle cell disease, sickle cell trait and the Hb AA phenotype, respectively (Figure 2). Figure 2. Performance characteristics of SickleSCAN™ and CAE. A total of 194 health workers (evaluators) and 221 subjects, respectively, participated in the Phase 2 evaluation of SickleSCAN™’s acceptability and feasibility as a screening tool. Findings from survey of the evaluators, showed that 68.0% described their overall experience in use of SickleSCAN™ as very good, 29.0% as good and 3.0% as fair. None of the evaluators felt it was a poor or bad tool for sickle cell disease screening (Table 4). Table 4. Acceptability of estimated cost of SickleSCAN™ test. In terms of turnaround time, SickleSCAN™ was rated highly by 92.0% of the evaluators at or above good. Only 2.5% of the evaluators rated the turnaround time as poor. In terms of cost, SickleSCAN™ with a tentative price tag of about one-third and one-sixth of the current cost of CAE and HPLC, respectively, was adjudged by 56.0% of the evaluators ≥3 (fair) on the scale, whereas a quarter felt it was unacceptable (Table 4). About 90.0% of a sub-set of evaluators, who had expertise in laboratory methods, rated SickleSCAN™ as good or above that scale, compared to the two other methods (HPLC and CAE) of sickle cell disease diagnosis. This was an indirect but key index of the feasibility assessment. A very high percentage (97.4%) of the evaluators returned an affirmative response in willingness to recommend SickleSCAN™ as a screening tool for sickle cell disease; only 2.6% did not endorse it for this purpose. The evaluation of the acceptability outcomes between the subjects showed that two-thirds (67.0%) and 81.0% of them adjudged as very good, their overall experience and turn-around time, respectively, with the SickleSCAN™ screening procedure. Only a small percentage (∼3.0%) of the subjects reported unwillingness to recommend SickleSCAN™ to friends and/or family as a screening test. This is a preliminary report of the performance of SickleSCAN™ undertaken at a busy primary healthcare center in a semi-urban setting and its acceptability in a nationwide multicenter survey, in a developing country with a high prevalence of sickle cell disease. The previous report [19Kanter J, Telen MJ, Hoppe C, et al. 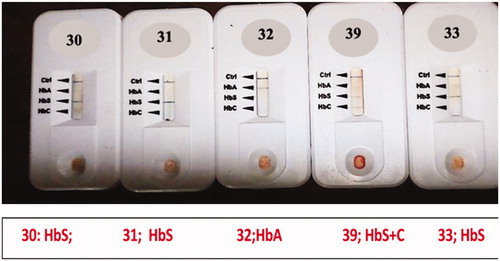 Validation of a novel point of care testing device for sickle cell disease.BMC Med. 2015;13:225. doi: 10.1186/s12916-015-0473-6. [CrossRef], [PubMed], [Web of Science ®], [Google Scholar]] of the validation of SickleSCAN™ involved known sickle cell disease patients recruited from clinics in South Carolina, North Carolina and California in the USA, and was undertaken by trained personnel in a controlled environment. In the first phase, our study was a direct evaluation of the performance of SickleSCAN™ in detecting Hb variants as a screening tool in a real world primary healthcare setting by healthcare workers who, except for one person, had not seen the screening device prior to field testing. We compared the performance of SickleSCAN™ in detecting common Hb variants to conventional CAE and the gold standard of HPLC. SickleSCAN™ demonstrated a sensitivity of 100.0% for sickle cell disease, 92.9% for Hb AS and 97.6% for Hb AA, respectively, with specificity of 98.2% for sickle cell disease, 97.7% for Hb AS and 100.0% for Hb AA. All the positive samples were confirmed by all the team members. It was able to detect all subjects with sickle cell disease with no prior history of sickle cell disease and all subjects with Hb C variants but one subject who was a sickle cell trait was misdiagnosed as having sickle cell disease. This could be disheartening to the subject concerned if the result was not confirmed using HPLC, however, it is better than a POCT with high specificity that fails to detect a treatable disease. 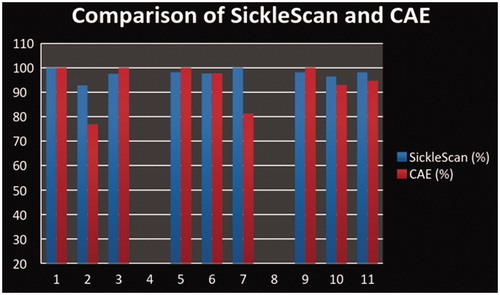 The specificities of SickleSCAN™ for sickle cell disease, Hb AS and Hb AA were 98.2, 97.7 and 100.0%, respectively. SickleSCAN™ correctly identified all subjects with abnormal Hb variants including the compound heterozygote for Hb SC. It had a marginally better performance than CAE and was able to detect the carrier, Hb AC, which was not detected by CAE, the most common method for routine detection of Hb variants in Nigeria. The overall test efficiency for SickleSCAN™ was 98.2% for Hb AA and sickle cell disease (SS and SC), while its test efficiency for the sickle cell trait and AC trait was 96.5%. Our findings are comparable to those of McGann et al. [20McGann PT, Schaefer BA, Paniagua M, et al. Characteristics of a rapid, point of care lateral flow immunoassay for the diagnosis of sickle cell disease. Am J Hematol. 2016;92(2):205–210. [CrossRef], [Web of Science ®], [Google Scholar]] who noted sensitivity of 98.3–100.0% and specificity of 92.2–100.0% of SickleSCAN™ to detect the presence of Hb AA and Hb SS. Our study, however, was conducted in the real world setting of a primary healthcare center in a developing country, which McGann et al. [20McGann PT, Schaefer BA, Paniagua M, et al. Characteristics of a rapid, point of care lateral flow immunoassay for the diagnosis of sickle cell disease. Am J Hematol. 2016;92(2):205–210. [CrossRef], [Web of Science ®], [Google Scholar]] had suggested as the next phase in the testing of SickleSCAN™. These aforementioned findings, coupled with the high level of acceptability indices are encouraging, showing that SickleSCAN™ can be applied as a rapid screening test at the point-of-care in rural areas, without the constraints of having skilled technical staff, expensive equipment and reagents and power supply. The ease of use and interpretation of the test results were two vital positive attributes of this POCT device noted in this study. This was buttressed by the 100.0% concordance in result interpretation by the test kit observers and the finding of more than 95.0% of the evaluators recommending SickleSCAN™ in an overall appraisal for sickle cell disease screening. In addition, there were favorable approval ratings for SickleSCAN™ by the subjects evaluated, while the finger prick procedure for the test is similar to that of most POCTs, the fact that the turn-around time for sickle cell disease results was drastically reduced in this case, was a very strong factor for the high acceptability, particularly the aspect of willingness to recommend it to others, by the study subjects. We also observed that SickleSCAN™ did not require special storage and that the results have not faded from the test cassettes, about 9 months post-testing. These observations, unarguably, will greatly aid community-wide screening programs. However, as with any screening test, positive samples identified by SickleSCAN™ should be confirmed by HPLC, capillary electrophoresis or IEF methods. SickleSCAN™ has high sensitivity in the detection of the common sickle Hb variants (Hb A, Hb AS, Hb AC, Hb SC and Hb S) and is able to correctly identify individuals with the usual adult Hb at the point-of-care. The test may be conducted by healthcare workers without prior training and expensive equipment, independent of electric power supply, giving it high feasibility indices as a screening tool. It was also shown to have high levels of acceptability in pertinent indices between both subjects and evaluators. This rapid POCT can be used in primary healthcare settings in the developing world to identify children with sickle cell disease early enough for appropriate management interventions [4Nnodu OE. Interventions for the prevention and control of sickle cell disease at primary health care centres in Gwagwalada Area Council of the Federal Capital Territory, Nigeria. Cureus. 2014;6(8):e194. doi: 10.7759/cureus.194[CrossRef], [Google Scholar]]. Serjeant, GR. Sickle-cell disease. Lancet. 1997;350(9079):725–730. Adewoyin AS. Management of sickle cell disease: a review for physician education in Nigeria (sub-Saharan Africa). Anemia. 2015;2015:791498. doi: 10.1155/2015/791498. Rahimy MC, Gangbo A, Ahouignan G, et al. Effect of a comprehensive clinical care program on disease course in severely ill children with sickle cell anemia in a sub-Saharan African setting.Blood. 2003;102(3):834–838. Piel FB, Patil AP, Howes RE, et al. Global epidemiology of sickle haemoglobin in neonates: a contemporary geostatistical model-based map and population estimates. Lancet.2013;381(9861):142–151. Akodu SO, Diaku-Akinwumi IN, Njokanma OF. Age at diagnosis of sickle cell anaemia in Lagos, Nigeria. Mediterr J Haematol Infect Dis. 2013;5(1):2013001. doi: 10.4084/MJHID.2013.001. Tshilolo L, Kafando E, Sawadogo M, et al. Neonatal screening and clinical care programmes for sickle cell disorders in sub-Saharan Africa: lessons from pilot studies. Public Health.2008;122(9):933–941. Alsan MM, Westerhaus M, Herce M, et al. Poverty, global health, and infectious disease: lessons from Haiti and Rwanda. Infect Dis Clin North Am. 2011;25(3):611–622. Piel FB, Hay SI, Gupta S, Weatherall DJ, et al. Global burden of sickle cell anaemia in children under five, 2010-2050: modelling based on demographics, excess mortality, and interventions.PLoS Med. 2013;10(7):e1001484. doi: 10.1371/journal.pmed.1001484. Williams TN. An accurate and affordable test for the rapid diagnosis of sickle cell disease could revolutionize the outlook for affected children born in resource-limited settings. BMC Med.2015;13:238. doi: 10.1186/s12916-015-0483-4. Diallo D, Tchernia G. Sickle cell disease in Africa. Curr Opin Hematol. 2002;9(2):111–116. Pagana KD, Pagana TJ, Editors. Mosby’s Manual of Diagnostic and Laboratory Tests. St. Louis, MO, USA: Mosby Elsevier, 2006. National Committee on Clinical Laboratory Standards (NCCLS), User Protocol for Evaluation of Qualitative Test Performance; Approved Guideline, in NCCLS document EP12-A [ISBN 1-56238-48-6]. NCCLS, Wayne, PA, USA. (http://demo.nextlab.ir/getattachment/941b0557-33b3-4739-8fcf-45f8088ae6dc/CLSI-EP12-A.aspx; accessed April 5 2017). Wethers DL. Sickle cell disease in childhood: Part II. Diagnosis and treatment of major complications and recent advances in treatment. Am Fam Physician. 2000;62(5):1309–1314. Hara S. Reliability and modification of Sickledex test. J Natl Med Assoc. 1973;65(5):431 passim. Chen TG, Lathrop RP, Shevkoplyas SS. The case for rapid diagnosis of sickle cell disease: a literature review. J Global Health Perspect. 2012:1–7 [Internet]. (http://jglobalhealth.org/article/the-case-for-rapid-diagnosis-of-sickle-cell-disease-a-literature-review-3/; accessed April 5 2017). Kanter J, Telen MJ, Hoppe C, et al. Validation of a novel point of care testing device for sickle cell disease. BMC Med. 2015;13:225. doi: 10.1186/s12916-015-0473-6. McGann PT, Schaefer BA, Paniagua M, et al. Characteristics of a rapid, point of care lateral flow immunoassay for the diagnosis of sickle cell disease. Am J Hematol. 2016;92(2):205–210.